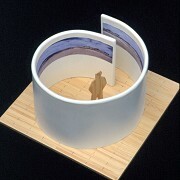 A sculptural work of a 360°-panorama is a narrow picture-strip. Mine panorama-design is repeating the same detail-motive at its left and right side. In fact these are almost 400°-panoramas. According to this double-detail there was the idea to apply the panorama on a snail-like wall. Its access would be at this lap position. 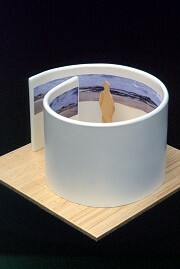 This accessible panorama-sculpture should be the highlight of my 2003 exhibition "Fotografiken". Unfortunately the sponsoring by a dry-construction-company was not possible according to too small time for sculpture installation and dismounting being provided by the city of Aachen.